In 1955 the BBC Film Unit wanted to expand. Up to then it's small staff had come mainly from the film industry, but new jobs were advertised internally and I became one of the first three to go into film recording. So I found myself in the Dubbing Theatre at Lime Grove. This was in the South Block and four floors up! I was put on Grams. The picture is actually an early shot of the AP Dubbing Theatre, but the one at Lime Grove was basically similar. In those days, apart from "talking heads" with lip sync, almost all film was shot silent and music and sound fx were added in the Dubbing Theatre from BBC discs. 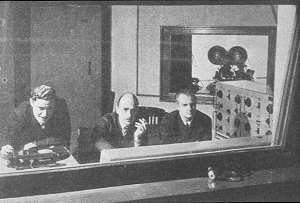 Read an account of a typical dubbing session in the years around 1956. The Lime Grove theatre had a row of three gram desks, known as TD/7s, each unit comprising two Garrard variable-speed 78rpm turntables. The pick-up on each turntable was an EMI type 12 with a sapphire stylus, and was mounted on a parallel tracking arm which allowed accurate cueing of discs. 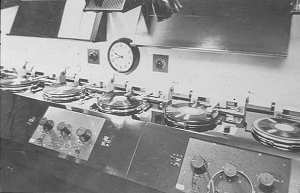 The picture above shows a bank of TD/7s in a radio studio, but the same equipment was used in the Dubbing Theatres, except that there was a shelf above the turntables to stack the, at times, large number of discs used in a dubbing session. On one occasion, we were dubbing a film insert taking place in a railway carriage, and I put on a BBC fx disc of train rhythm. We thought no more about this until a schoolboy wrote in later to say that by the rhythm of the wheels the train would have been going at so many miles an hour, but, by the speed at which the telegraph poles were flashing by the window, it was only going at such and such a speed..... You just can't win! We tended to use the same fx discs for most films and indeed some had become our "regulars". Then one day I heard a Children's Hour Radio play with what I thought were some new, or different car fx. So I sent a Memo by the Internal Mail to the programme's producer, Herbert Smith in Manchester. His reply began with "My rather astonished thanks for your kind remarks about our latest 'Cops and Robbers' play", and went on to say that they had used standard fx discs in the BBC library, and gave the disc numbers. I looked them up and found we had them also! So I started to use some of them instead of our "regulars". It just goes to show that one shouldn't become complacent. One day we ran a short 16mm film made by one of the young film editors, Allan Bell. It consisted of a fast chase sequence over the roofs of the Lime Grove studios. Just as the man in the film "ran out of roof space" and was left dangling in the air clutching a gutter, it cut to a title - To find out how it ends, join the BBC Film Club. I hope the short film survives somewhere. It was in November 1956 that the first Hoffnung concert was given and BBC Television relayed it from the Royal Festival Hall in London. A colleague in the Dubbing Theatre (who I will not name.....), wanted to record the music on 1/4" tape, so he asked C.A.R. to give him a feed of Television sound. Now as it happened the tape recorder in the dubbing theatre had a fault we didn't know about and sent high frequency recording bias back down the input line. Fortunately, EMI, subsequently issuing the concert on a Columbia LP, had a separate feed. In the 1950s there was a severe restriction imposed by the film industry on which films were available for a tv showing. Many notable films remaining "out of bounds" to television. However "compilations" of excerpts were allowed and Daphne Turrell produced these. On the other side of the corridor on the 4th floor leading to the Dubbing Theatre mixing and recording rooms were several small Preview Theatres and often in one of these Daphne would view a feature film to take notes of which excerpts she might possibly use. She graciously allowed a few staff members if free at the time to sit in during these viewing sessions. And so it was that I was able to see such notable films as The Dam Busters and the famous 1936 MGM film Mutiny on the Bounty. It was after running the latter film that I heard her remark that she was surprised at how good a film it was, not having seen it before. One of her compilations was of the songs and dances from the RKO Rogers and Astaire films, another the numbers from MGM's Singin' in the Rain. She also made compilations from the Paramount "Road" pictures with Bob Hope, Bing Crosby and Dorothy Lamour. In the 1950s films of the 1930s and 1940s were rarely seen, except occasionally in specialist cinemas, such as London's National Film Theatre. With the later relaxing of the restrictions, films such as those could be shown on television in their entirety and so such compilations became unnecessary and were discontinued.